Indian Institute of Handloon Technology, Bargarh invites application from eligible candidates for the 3 year Diploma programme in Handloom Technology for the session 2017-18. Read below for more details. Eligibility : Candidates who have passed 10th or above exam in one chance and having English as a subject. Reservation : There are 205 reservation for the Handloom cast. Stipend : The students enrolled in these subject will get stipend during their study. The stipend amount is Rs 1000/- Per month during 1st year, Rs 1100/- per month during 2nd year and Rs 1200/- per month during 3rd year. 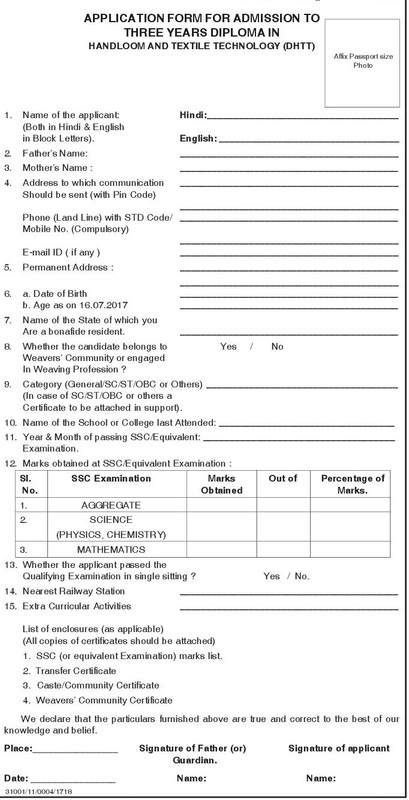 Eligible candidates having requisite qualification should apply in the prescribed application format before 20-05-2017 to the below given address.